S: Speak. And we shall never converse about this speech ever again. 3. Has a book ever filled you with rage? F: YES. But I don’t remember them or why anymore. Which might as well be for the better. Or else I’d scream. S: THERE HAVE BEEN SO MANY. I could probably classify them by genre or what exactly made me rage. Honestly, when I rage, it’s because the book filled me with so much hope and somehow ended up ruining it. F: Now that I’ve finished A Gathering of Shadows by V.E. Shwab, KELL AND LILA. Together, it’d be Kila and I have to say that it’s a pretty killer name! See, it fits better than Kell’s awesome coat on himself! 5. Has there been a book which has genuinely scared you? F: When I was younger I used to be really scared of The Maze of Bones. (I wouldn’t sleep and I’d just stay up awake because I was scared. I was like, “They’re going underground where there are a bunch of SKELETONS AND STUFF! !”) Then, I got over it and I was like, seriously? The 39 Clues were kind of cool at first but it just got soooo annoying. There were SO MANY BOOKS that I just got kind of… ehhhhhhhh about it all. THERE WERE TOO MANY OF THOSE BOOKS. Now, I just stay away from any type of horror at all. I’m a weak soul, I’m sorry. Honestly, I hunt Killers by Barry Lyga (as well as the rest of that series) were uber scary. Serial killers freak me out… but I can’t stop reading about them. Don’t read this book in the dark, or home alone. You will freak out. 6. Favourite fictional animal/fantastical creature? F: I bet Festus would look pretty cool in real life. Bernie Kosar is also a cool chimerae. Oh, and Toothless from How to Train Your Dragon. Baymax (Big Hero 6- love the movie by the way… there are Asians * whole world gasps *) is cute and all but I want something that can fly and spit blue incinerating balls of energy. S: This… thingy/pet from the Hound of Rowan. I was so taken with it’s coolness that I even created fanfic and fanart to try to convey my love. F: Camp Half Blood, obviously. But I doubt it’s fantasy. It’s real, I assure you. You guys just haven’t been there yet. 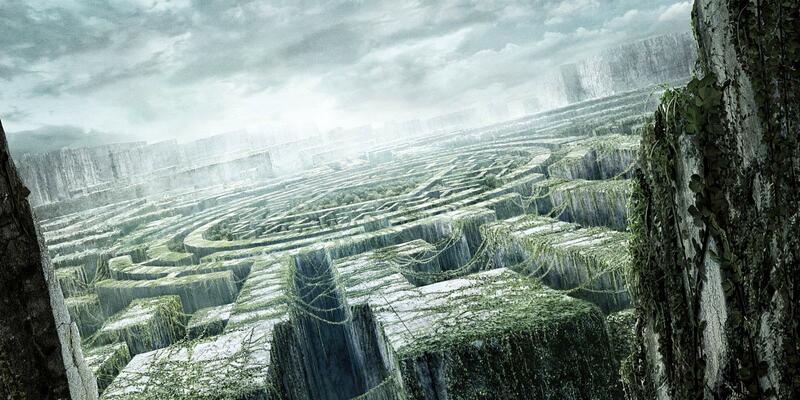 This, on the other hand, does not look as a-MAZE-ing. 8. Which book completely exceeded your expectations? F: The Infinite Sea. After reading The 5th Wave, I was like “Ehhhh, I don’t know about this” because the first book was slowwwww and I just didn’t really like it. But I found myself enjoying the second book way more than I had anticipated. So that was good. S: So many books. It’s why i keep my expectations super low, so that I don’t end up disappointed when I read the books. If you check our Goodreads High expectations shelf, you can find a lot of books that either surpassed or didn’t meet my expectations. 9. Are there any books you’ve disliked from an author you usually love? F: OH YEAH. I THOUGHT I WOULD LOVE MAGNUS CHASE TO PIECES – but I was wrong. This is an absolute first for me, especially from Rick Riordan’s books. I was MENTALLY PREPARED to endlessly squeal about it like a mouse in a trap… except in a good way. Then I read it, and I just didn’t laugh as much as I usually do for his books and I didn’t connect to the characters as much either. Sooo that’s that. 10. What’s your favourite book in a genre you don’t normally read? S: I read almost all genres : I like to switch things up. I think I read everything but dystopian: and I have yet to find a mind-blowing, amazing dystopian. “Here, I brought you a book you might want to read,” said Faith as she handed Sarah a copy of Salt to the Sea by Ruta Sepetys. Since they borrowed most of their collection of books from the library, they got into the habit of exchanging books they thought the other person might enjoy. It was just a convenient way to read more without having to wait for their books to arrive at the library. 11. If you had another blog, what would you write about it instead of books? F: I’d blog about random things like random places I’ve been to (like TRAVELLING), poetry/short stories, maybe some study tips and encouragement. Oh, and some dramas/shows I’ve watched. Doesn’t mean I wouldn’t now, but for now books consume most of my blogging time. I probably will post some of these things in the future too! Do you dream in black & white or in colour? You have the choice: an infinite number of books (you don’t have to pay a cent) – but no where to put them or one book that contains an infinite amount of books, but you pay a dollar a week. Which one? Have you ever been aware of being featured in someone else’s dream? If so, were you satisfied with your casting or… was it strange? Infinite access to money or infinite access to books? If money, what would you do? Likewise if you choose books, what would you ask for? Tell us all about your strangest dream! Infinite time that stops while you read (but you still feel the effects as if it passing normally), or the ability to speed read, but under a limited amount of time? Have you ever dreamed that you were in the plot/setting of a book you recently read? Or have you ever interacted with book characters in your dream? Everything you touch immediately become animate Grinches… what do you do next? Describe your happiest dream in colours. Random Challenge: say “Toy Car” 10 times fast and write down what “word” you end up having at the very end. (Consciously) write up your own dream consisting of all your favourite things plus a mammoth wearing a onesie. Thanks for stopping by – Drop us a comment if you have any burning thoughts and opinions or a mystery to solve! Yea, I was surprised that I actually really liked it! Rainbow Rowell has her way with fiction. The closest I can come to challenge your need for Arab Canadian in YA is E.K. Johnston’s A Thousand Nights (Arabian Nights retelling, YA, and written by Canadian author). CLOSE ENOUGH. Thanks for doing the tag guys! 🙂 Loved your answered. Faith – you’ve got me really excited to read A Darker Shade of Magic! Sarah – I Hunt Killers sounds awesome, I’ve been looking for some more scary reads so thanks for the recommendation! Alsooo I’m seeing a lot of Rick Riordan love in this post – I’ve never read any of his books, and I have no idea where to start because there are so many haha. What would you guys recommend I read first? No problem, it’s been wayyy overdue anyways! Aha yes, A Darker Shade of Magic only gets better with the sequel! I’m sequealing!!! YES, RICK RIORDAN BOOKS ARE WITTY, HILARIOUS, ACTION, ADVENTURE AND MAGIC all packed into books. Hmm so, here’s what I’ll recommend. There are, as of now, 2 Percy Jackson series. The first, Percy Jackson and the Olympians, is pretty middle grade from the style of writing to his personality. But in that series, he grows a year old with each book. The second, Heroes of Olympus, is where the fun really starts with a bunch of new cast that’s even more hilarious and amazing and ship-worthy. That’s when the writing is more towards YA and you could really see how Percy matured. Anyway, I would definitely recommend getting some background info on the main characters first before diving in to meet all the rest – so read the first series first then the 2nd. (He has other series too but I recommend the Percy Jacksons the most). If you’re on a time crunch and want to get to the 2nd series, you could cheat and read the first and last books of the first middle grade series (though you won’t get some of it but soon you’ll catch on) then skip to the second series. That way, you’ll understand it more. Sorry for the whole rant and tangent! It’s just my inner love for the books. 😀 They get me laughing out loud all the time haha. You’re very welcome! It IS good! It’s one of those kinds of books that I don’t mind rereading any time of day and I still get a laugh out of them. It’s just a somewhat carefree innocent adventure but it’s intense all at the same time. I don’t know. Basically, the adventure and actions scenes (which play out so wonderfully) are perfectly balanced by the comic relief. I’m always rooting for Percy all the way. And when you read about his journey through the books, he’s literally growing up so fast and I probably become tearful just thinking about it haha. Horror is not fun. Hello, but goodbye. NO. YOU LIE. HOW CAN MY LIFE BE A BOOK. It’d be a sad one, at that. 😛 But maybe I’ll write some type of short sometime in the summer? I don’t know! It would be BEYOND EPIC if it even got published. Normal people would be like, “I’m happy/excited to tell you that… I’m publishing a book!” If that was me, I would be like “OKAY A;LKFHSDVLFBNA;SBNLSNVL;ADFJ WAIT. LET ME CATCH MY BREATH. AVJALVF;AFJK;AF;DF. YOU’LL NEVER GUESS WHAT.” And people would think I’m making a big deal out of everything… but how do you stay calm if you’re writing and PUBLISHING A BOOK??!! I really don’t know. AHAHAHA YES PLEASE DO. Just know I will preorder that thing a decade beforehand (time-travel comes in really handy these days). OH GOSH, if I get a publishing deal I will think that the world died and shrivelled into a weird bubble BEACUSE I CANNOT WRITE. Yet when the breathless news gets delivered from you? I WILL BE YOU’RE NUMBER ONE FAN AND I WILL BE BY YOUR SIDE TRYING TO CATCH MY BREATH FROM THE EXCITEMENT. How can I stay calm when YOU’RE PUBLISHING A BOOK? Oh I know: YOU CANNOT. HAHAHHAHAHAHHAHAHA SO MUCH CAPS LOCK WE SHOULD PROBABLY NOT MEET IRL OR ELSE LIKE WE’VE SAID BEFORE, EVERYONE AROUND US WILL BE OVERWHELMED BY OUR RAINBOW SPRINKLES. If I ever do make ARCs, mine will be the most beautiful sprinkely rainbow arc ever. 😛 Hopefully. NO I NEED TO SEE YOUR SHORT STORIES I BET THEY’RE GOOD STOP BEING SO HUMBLE. I mean unless they’re actually made for cute animals in which case, I’d totally read it. AHA ITS BECOMING A PROBLEM BUT OH NO, I FEAR THE SANITY OF THE WORLD. OUR RAINBOW SPRINKLES WOULD OUT-SPRINKLE THE BALANCE OF THE WORLD AND THEN WHAT WOULD HAPPEN?! OH YES, I do love my beautiful sprinklely rainbow arcs SO DOES THIS MEAN I MUST HAVE THIS ARC (YESYESYESITDOES). Oh no, I must stop you before you kill your mind with my bland vocab and terrible ideas BECAUSE I’M NOT JOKING ITS HORRIBLE (which means you lost the bet – GIMME ALL YOUR MONEY). AHAHA cute animals CUTE ANIMALS. yes i don’t know how some people like typing without a single capital at all. it just seems so un-grammar and so monotone. meanwhile with caps grammar isn’t even an issue ya know? but with no caps at all it’s like torture. i’m restraining so much from pounding the caps lock button just to see how it’s like with no caps at all. its a struggle. i love arcs. we’ve never gotten one though. knowing us, we’d probably cause another world depression because of our spam mail replying skills. ps pls read percy jackson asap or my heart will be in so much sadness. OH GOD THIS WAS HARD TO READ. THIS IS VERY UN-FAITH-LIKE ITS SCARES ME. You’re right, HOW DO THEY DO IT? AHA, perhaps all the caps-lock is just my way of hiding how TERRIBLE I am at grammar, I CAN FEEL THE STRAIN OF NOT TOuCHING THAT CAPS LOCK BUTTON. Aha, that’s me exactly! Never received an arc BUT I LOVE THEM. I will be joining you in that world-depression spamming them because WHY HAVEN’T THEY GIVE YOU GUYS ARCS. You guys would just SLAY those reviews I might cry from your awesomeness. YOUR HEART CANNOT BE IN SADNESS I WILL READ THAT BOOK ASAP. IT IS EXACTLY. MY MUSCLES ARE TELLING ME TO JUST CAPS LOCK EVERYTHING. But oh of course, caps lock doesn’t help you breathe BUT IT MAKES IT A LOT MORE COMFORTABLE TO HOLD YOUR BREATHE OR SCREAM. Oh yes those publishers must or else we must tackle them with our plan b (which still must be thought out) I do not know what that reference to Mean Dragon Slayer Story is but I will pretend like to do AND MARCH TO SLAY THOSE DRAGONS.